And Happy Children's Book Day! Plus, it has such a pretty sound. April. So pleasing to the ear. But let's hearken back to the bygone days of February and March for one second. Due to the March Madness Writing Contest preempting WYRI last week, I didn't get to announce the winner of the February Pitch Pick, so. . .
prup prup-pr prup-prup pr prup! Congratulations also to our other brave pitchers, all of whom had wonderful story ideas and well-written pitches! Good luck to all of you with your stories! Today's pitch comes to us from Frances, who says, "I began writing children’s stories many, many years ago, but I got sidetracked by needing to make a living! Now that my son has started college, I feel I have the time to devote myself to my passion for children’s literature once again. I have an MFA in Creative Writing, and I have been writing and editing professionally for about 30 years. I currently work as a freelance editor and am a member of SCBWI, Children’s Books Insider, and Julie Hedlund’s 12x12 Forum." The Pitch: Peter wants to be friends with Asbury the tree, but when he finds out that Asbury will be cut down, he comes up with a plan to save Asbury. In the process Peter discovers a very special gift that he and Asbury can share forever. I hope Phyllis did something silly on April Fools Day. Congratulations, Kristine. Yes, I would read it. If you want to stick with two sentences for a very short pitch, I would just change one "Asbury" to "her." (Peter wants to be friends with Asbury the tree, but when he finds out that Asbury will be cut down, he comes up with a plan to save her.) But, if you want to add one more sentence, I think you could give us a clue as to what Peter does to try to save the tree and/or a hint as to the special gift that they can share. Wow! Yes, it is April and it seems time is mounted on wings, speeding along quickly. I'm a MAYBE. I am wrestling a bit with "Peter wants to be friends with Asbury the tree, but" Is he already the tree's friend when he hears that it will be cut down? Or does he decide to be its friend only after he learns it? Is there some obstacle to his friendship? If wanting/struggling/striving for friendship is part of your story, then you might want to explain a bit more. If not, then I think it would be stronger to start with "When Peter finds out that Asbury will be cut down...", and then to give us one more sentence with a bit more meat about the gift. Hope this helps a smidgen. I am new to critiquing pitches, so take this advice with a huge grain of salt! I *am* very curious about what happens to Asbury! I say yes to the pitch but I had the same thought as Victoria about the first sentence. Why exactly does he want to be friends with this tree? It's odd even for a little kid. But aside from that, I do like it a lot and think it's very well written! Wow--thank you Victoria, Teresa, Angela, and Pam for your excellent comments/questions. Does this revised pitch clarify things? I'm a MAYBE. I think I am needing a stronger emotional bond between Peter and Asbury. I, too, am new to pitch critiques. I hope this is helpful, though. Hi Frances, I would definitely read this as I love trees and any cause for saving them gets me, especially coming from a child. That said, I think you're pitch could use a little tightening, and perhaps add a little insight into the basis of the friendship. Some questions I had were-- Why does he want to be friends with a tree? Does he love her canopy? Is he lonely? Is the tree helping him overcome some kind of flaw? Thanks for sharing! Mmmmm. 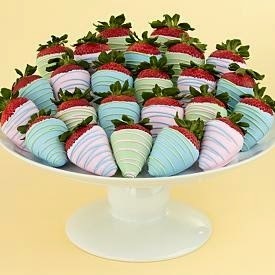 Love the strawberries. I am also in a maybe camp. I have a little trouble with kids wanting to befriend things like trees or other non-animal beings, although Sophie's Squash is a fabulous book, so maybe this will be as well. I guess I need more information about what will happen to make me want to read it. between two humans. And Asbury is fully "tree" throughout the story--he's not anthropomorphized, even by Peter. Nonetheless, he gives something to Peter that only a true friend can give. And like the acorn seed that shows little promise of the majestic oak it will one day become, Peter’s love for Asbury is the seed that inspires Peter’s unexpected dreams. I'm not sure how much more to reveal in the pitch so that I don't give the ending away. If I had to sum up the essence of this story, it's that you just can't tell when a child is young what wonderful things they will do when they get older. I had peanut butter and jelly on my waffle this morning! So I am in the proper spirit of things. Also, your trumpeting is terrible. okay, i would read this , as I'm definitely an environmental advocate. btw, i didn't go back and read all the comments. even though i like the set-up, i have to say that the pitch is not that exciting. maybe you could spice it up with something specific, without giving away too much of the story. wondering why you named the tree asbury. PBJ - ah, been a while! And YES to strawberries! Congrats, Kristine! As for the pitch. I am maybe too. The title puts me in a funky frame of mind, sounds like adult NF and not of the light, humorous or entertaining sort. Doesn't mean I wouldn't try though! I would like to know if Peter's desire to befriend a tree means he is lonely (my daughter named all our trees and never attempted friendship, just made it happen! ), what Peter has in mind to save the tree, and if this will remain a serious, quiet, slice-of-life sort of book or does Asbury have a fictitious personality too? Thanks for the feedback, Julie. In a later revision I changed the title to PETER AND ASBURY, since too many people reacted negatively to the title. It came from a question my son once asked me about a tree in our neighborhood. On one level the story is serious in that it deals with a child who is misunderstood by his teacher and classmates, but on another level it's a very positive, uplifting, and I hope entertaining story about the way love overcomes limitations. Rather than a slice-of-life story, it's more of a character-drive picture book. Asbury is a real tree at the start of the story, but after he's cut down, he undergoes a transformation (as does Peter). Hi, Belinda, thanks for your feedback. When my son was very young he named trees. His favorite was "Asbury," who lived on Asbury street. I wish I knew what to say to spice this pitch up without giving away the ending. Asbury is cut down but Peter saves a large branch. The branch plays a part in the rest of the story. I guess that doesn't sound too exciting! I'll have to think about how to make this pitch jazzier. Hi, Rosi, thanks for reading the pitch and commenting on it. "Befriending" is probably not the right word to use--the main character is a 6-year-old boy who loves trees and is fascinated by them. The tree is transformed into something else by the end of the story, but it's a very natural process--nothing fantastical. Hi, Karen, thanks so much for your feedback. I love trees, too. The main character--a six-year-old boy--is shy and socially awkward. He doesn't so much make friends with Asbury as he finds comfort in its presence. The tree is actually cut down, but the boy "saves" a part of the tree. It's what he does with the branch that carries the rest of the story. I'll have to figure out how to allude to this in the pitch that makes more sense. I should have used a term other than s.o.l. because what I meant is a real, non-fiction story. It's just not clear from the pitch, but I'm sure you'll get there - happy to read again in the future. Have you posted it in the 12x forum? I need to get back there! Thanks, Frances, for the explanation. That does sound a lot more interesting. Maybe just changing it from "be friends" to something else would help. I'm never quite sure what s.o.l. stories are--it seems like that description would fit a lot of stories, but I notice that many agents say they don't want s.o.l. stories. Although my story has some true-to-life aspects to it, it's fiction. I did post it on 12x12 a while back--I need to send in my revision. I'll look for you on the forum! I would read this. I only checked out a few of the comments, since I'm so late to the game, but I do like the new title Peter and Asbury better than Dead Trees.... I also think it would start stronger if Peter and the tree are already friends, so you can get right to the problem of him potentially losing his tree. Good luck with it. I'd read your story Ms. Kalavritinos! :) I don't think I can add to what the others have said. I love your idea! Thanks so much for your helpful suggestions for Frances, Belinda! oh, wow, that's a much different story than I was envisioning! I really like the idea of your story, so think you need to somehow weave the plot into your pitch. The original pitch sounded like the boy saves a tree kind of story. How about starting with "When a boy's beloved tree is taken down, can saving a cherished branch help him discover (fill in the rest, you get the idea). Good luck, it sounds endearing! Congrats, Kristine...love the STEM girls pitch! I like the changes you've made in the pitch...and would tighten the revised one a bit. When Peter finds out that an ancient oak tree he has befriended will be cut down, he must confront teasing classmates and come up with a plan to save Asbury, ultimately discovering a unique gift they can share forever. happens to ordinary people all the time. I am also a maybe, too. I assumed from the title it was NF, and think this needs tweaking to make it zing a bit more and sounds really kid-friendly. If Peter wants to save Ashbury, then it sounds like he was probably already friends with the tree, no? Maybe you could start the pitch with Peter naming his favorite tree? I do like environmental stories. Love the naughty fruity snack, Susanna! Karen--that's it! I'm misleading the reader when I say Peter"saves" the tree. You have really helped me a lot. I think I know how to fix the query now. Everyone's comments have been great!!! I love that pitch actually. What a busy week it is. National Zoo Day tomorrow! Congrats Kristine. I suppose the only thing I would add at the beginning is a motivator why he wants to be friends with the tree. I'd say maybe. Just reading the pitch, not seeing the book on a shelf I'm left wondering: who is Peter? A boy? An animal? Another tree? Why does he want to be friends with a tree? I have to say, I just love any picture book that has a tree as the main character so I would read it but I think Frances has been given some great advice already. The title change is a great idea as it comes across as very negative, when as Frances mentions earlier, it is actually a fiction picture book no non-fiction. We need to find out more about Peter and Asbury, and this unlikely friendship and how it transforms throughout the story, that will hook a potential reader in. I also have to extend a huge congrats to Kristine for her Stem girls pitch win so delighted and itching to hear what Erin has to say about it. Best of luck Kristine, hurrah.. Thanks so much for your comments for Frances, Julie! Thanks for sharing your perceptions, Kimberly! Thanks, Catherine! Hope Weirdo Zoo is getting lots of love on National Zoo Day!